Another of our First Editions, this 1994 tome was published by Weidenfield and Nicolson to universal acclaim and the intervening years have not lessened its impact.This 290 x 308 mm hard cover book runs to 230 pages and is lavishly illustrated throughout. 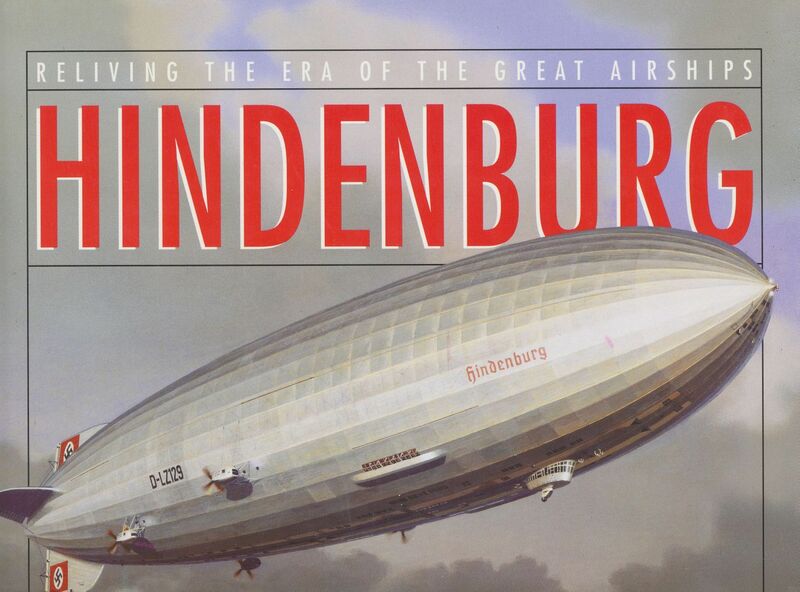 An excellent chronicle of the ill-starred Hindenburg is prefaced with a general rigid airship history that ably sets the scene. Specially -commissioned paintings by the American artist Ken Marschall [noted for his Titanic art that was employed by James Cameron for his block-busting movie] give vivid portraits of the doomed dirigible as well as the Graf Zeppelin and the British R101. Among the evocative recreations that bring these long-lost leviathans to life ,the R101 battling a squally night sky as she heads across the Channel to meet her destiny,and the Hindenburg overflying Rio, remain the most outstanding. The book's generous format is put to good use with large area period photos being employed to maximum effect;there's also a fold -out colour section that includes cutaways of the entire ship as well as schematics of the passenger quarters and the control car interior. Contemporary Zeppelin Company illustrations are included and there are even rare colour photos of the ill-fated ship as she lies burning on the field at Lakehurst. This copy is in good condition and comes complete with the original dust jacket which has a slight tear which we have repaired. Without doubt this is one of the best books ever produced on the Hindenburg -and one of the heaviest!- while the sheer number and quality of the illustrations enhance the already high reputations of the author, illustrator and publisher. Highly recommended.